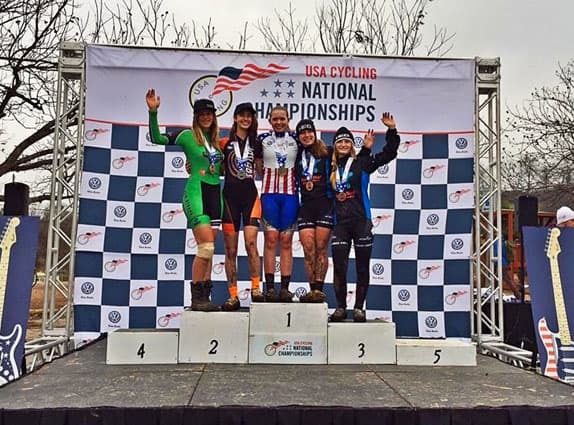 Killington Mountain School Cyclist Turner Ramsay rode her way to the top spot on the podium at US Cyclocross National Championships, held last week in Austin, Texas. Though the race was mired in controversy, she was able to take advantage of her training and technical abilities to open a significant gap on a very talented field of U17 women to become the 2015 National Cyclocross Champion, bringing the Stars and Stripes Jersey back home to KMS. An unfortunate series of events wreaked havoc on the last day of racing that was scheduled for Sunday, Jan. 11, at Austin’s Zilker Park. The race promoters and USA Cycling appeared to have done everything right with respect to the city property, but days of racing in the rain had turned the course to deep mud. USA Cycling employees toured the course with city officials every day, including Saturday night and were never given any indication that there would be problems holding the races on Sunday morning. However, later that night, members of the Austin Heritage Tree Foundation deemed the course setup as damaging and detrimental to trees in the park, and reportedly convinced a Parks and Recreation employee to shut down the event. When riders arrived at the course Sunday, they were turned away by police officers who told them that the race was canceled and to head home. As one might imagine, this was devastating and confusing for Turner and all the other cyclists. After much negation, USA Cycling was able to get Parks officials to allow them to hold the races the following day, Monday, starting at 12:30 p.m.
With the loss of a day and a mid-day start time on Monday, race organizers were left with only five slots to run seven race fields. The decision was made to hold the Junior 15-16 girls’ race at the same time as the Junior boys’ and girls’ 17-18 races. Coach Brad Ramsay comments that he isn’t necessarily sure this was the wrong decision, however, in hindsight, he comments that he wished the execution had been different. With three fields on the course at the same time, officials elected to employ the 80 percent rule based on the lead 17-18 male rider. This is commonly used in CX races, especially at the elite level, to prevent riders who are taking more than 80 percent longer to complete a lap from interfering with the race leaders late in the race. With the combination of riders on course, the unfortunate result was that many of the female riders were pulled from the race after only one lap. All of the 15-16 girls, and all but the top five 17-18 girls, were pulled after the second lap of what should have been a three lap race. Coach Ramsay says that the correct decision would have been to not pull any riders, nor to apply the 80 percent rule. The lead 15-16 girls had to pass many of the 17-18 girls and some of the 17-18 boys during their race, thus it ultimately seems unfair to have pulled them in order to clear the course for the lead 17-18 male riders. Passing other riders is part of racing. In Turner’s case, she was pulled after two laps, and there was a great deal of confusion. The officials rang the bell for her (indicating that she was starting her final lap), yet another official pulled her from the race moments later on the other side of the finish line. Turner knew she was the first place rider at that point, but amidst all the chaos and confusion she was unsure if she was supposed to take another lap or not, and was concerned that if she didn’t, she would be ruled as not having finished the race. Public reaction to both race officials’ decision to combine the Junior 15-16 girls’ field with the entire Junior 17-18 field, and to the choice made to pull 15-16 riders from the course after only one lap, has been strong, dominating social media over the past few days. USA Cycling has issued a statement explaining their choices and apologizing for the race postponement, and explaining their rationale behind decisions made on Monday. In a sport that struggles to attract and retain female racers, Coach Ramsay shared that he hopes that the controversy created at this event will lead to policies that will improve the experience for all racers. At such a big event there are certainly many logistics and factors at play, and it seems that everyone involved tried to make the best choices they could at the time. While the confusion did rob Turner of her immediate, big “victory moment,” she still comes away from the event with the title of US Cyclocross National Junior 15-16 champion. No one can take that away from her. The KMS community is incredibly proud of Turner, and looks forward to following her very promising cycling career. In additional KMS Cycling news: Jonah Mead-VanCort raced at US Cyclocross Nationals as well, riding with the very competitive U23 men and earning a top 30 finish. KMS Cyclists Mikko Aho and Vivien Rindisbacher also had great races, with Aho taking the 24th spot in the Junior 13-14 category, and Rindisbacher (age 15) fighting his way to an impressive 30th place finish in the highly competitive U17 Men’s field. KMS Cyclist Noah Barrow is now headed to Belgium, the Netherlands, and the Czech Rep for some European races, World Cup races, and the World Championships!